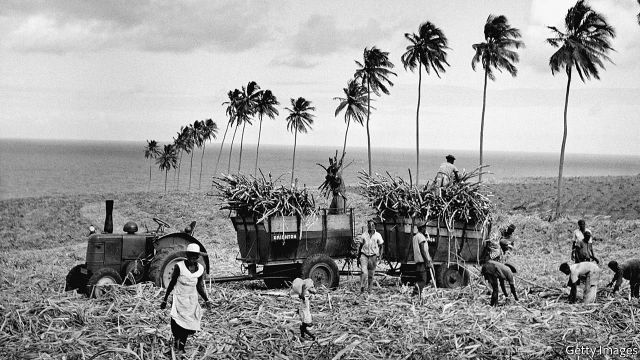 PORT OF SPAIN — IN ITS 18th-century heyday cane grown in the Caribbean and cut by African slaves provided Britain with nearly all its sugar. The masters of this brutal trade made enormous fortunes. But it has seen 200 years of decline, accelerating after slavery ended in 1838. Now the region is wondering how it will cope after a policy change by the European Union which could finally bring down the curtain. Today, the English-speaking Caribbean produces under 0.3 percent of the world’s sugar; Brazil grows nearly a quarter. Many islands have abandoned cane for more profitable activities. Trinidad closed its last sugar factory in 2007, and a gas-related boom took up the slack. St Kitts shut its last factory two years earlier, after the debts of its state-owned managers approached a third of GDP. A railway that trundled cane now carries tourists. St Kitts’s new staple is passports for foreigners, sales of which finance an opaque development agency, the Sugar Industry Diversification Foundation. Four Caribbean countries retain their taste for the sweet stuff; altogether, the industry employs more than 40,000 people. But even where it survives, sugar is in trouble. In Guyana, five percent of workers still cut cane. But the state-owned sugar company has been losing money since 2008, and exports are expected to plunge by nearly 40 percent this year. Nearly half the people on the payroll fail to show up regularly. The ruling coalition, which relies on voters of African origin, has laid off 3,500 workers who are mostly of Indian descent; this risks inflaming racial tension. The government has put three of its six sugar estates up for sale. There may or may not be bidders. Jamaica has privatised, de-privatised and re-privatized its failing sugar estates, selling three to a Chinese company in 2011. The buyer now complains of low productivity and an awkward government, and says growing sugar is easier in Africa. In Barbados sugar accounts for only 0.2 percent of foreign-exchange revenues (down from 55 percent in 1946), but the government says it hopes to revive the industry with a new $270 million factory on the site of an old one. The project has now been blocked by an environmental lawsuit. Only in Belize, where sugar provides a quarter of export earnings, does it seem to have a future. Last year a Guatemalan firm opened a factory there producing high-value white sugar. The region’s wrinkled terrain and volatile weather make it hard to compete against the mechanised sugar operations of Brazil and Australia; average costs in the Caribbean exceed the world price. Britain long offered the industry tariff protection, which was formalised by a Commonwealth Sugar Agreement in 1951. To avert catastrophe, Jamaica’s growers propose that CARICOM, a group of 15 mostly English-speaking Caribbean countries and territories, should slap a tariff of 40 percent on sugar from outside. But with many regional economies either stagnant or wrecked by storms, the 7 million people affected will balk at a policy that will raise the cost of biscuits and fizzy drinks, consolations which need lots of imported sugar. Selling Citizenship Pays Dividends In Caribbean … But At Price Of Security?